Why was Good Girls Revolt cancelled? Recently, creator Dana Calvo spoke with The Hollywood Reporter about Amazon‘s decision to terminate the freshman series. Set in the 1960s, the historical drama follows a group of young female researchers at a major news outlet who demand fair treatment in the workplace. The cast includes Genevieve Angelson, Anna Camp, Erin Darke, Hunter Parrish, and Jim Belushi. What do you think? Have you seen Good Girls Revolt? Do you want a second season? More about: Amazon TV shows: canceled or renewed?, Good Girls Revolt, Good Girls Revolt: canceled or renewed? 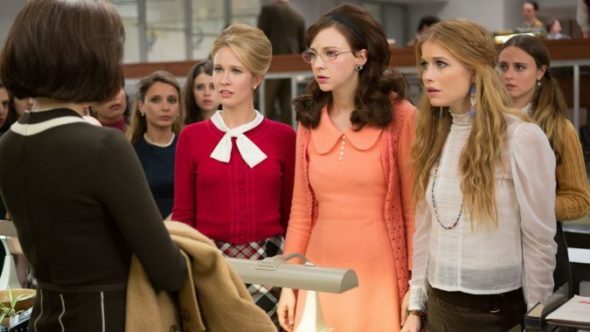 Good Girls Revolt: When Is the Women’s Rights 60s Drama Coming to Amazon? I was shocked to find out the show was cancelled. Also disappointed. I think it’s an excellent representation of what went on in the 60s having been there myself. I would love to see the show return as would many of my friends. Whoever made this decision for cancellation isn’t reading audiences well. EXCELLENT SERIES, EMPATHETIC AND OH SO CURRENT EVEN FIFTY YRS LATER. WOMEN AND MEN DEALING WITH ISSUES THAT SEEM TO NOT HAVE EVOLVED. AMAZON YOU HAVE A VOICE, USE IT! Good Girls Revolt is a great show with a great story to tell!! I am so disappointed and want the story to continue. Loved this show! Was very disappointed it wasn’t renewed, esp for the reason. I think they should revolt and find another avenue for the series! It’s a great series and great actors! This is the ONLY series I have enjoyed watching since Mad Men and Breaking Bad!!! I am really pissed off! !